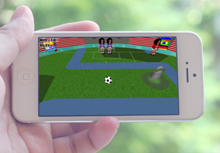 Feel passion of football: win the opponent and score а goal in 3D maze. You are not indifferent to the sport number one in the world, football; then this game is for you. 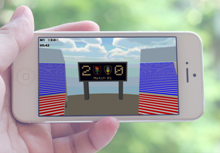 72 most fascinating mazes are waiting for you in 24 matches; avoid pools and try to score a goal. The ball will be taken down by wind, attracted by magnet; it will sink in pools, increase or slow; the light at the stadium will go down. However, all these will not be a hindrance for a real football fan. Determine your own strategy, think over tactics, beat players, take prizes, score goals and pass 3D football maze. To win, you must have skills of Lionel Messi, speed of Cristiano Ronaldo, force of Wayne Rooney, dexterity of Eden Hazard, power of Paul Pogba, purposefulness of Zlatan Ibrahimoviс, game thinking of Cesc Fabregas. You can operate the ball both by means of accelerometer and by means of a screen touch. 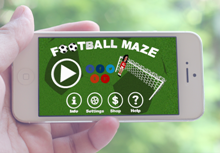 Spend you free time with this football maze 3d!